Narragansett Brewing Company, long-time sponsor of Major League baseball broadcasts and telecasts, today (October 17, 1950) renewed its sponsorship contracts with the Boston Red Sox for 1951 and 1952. 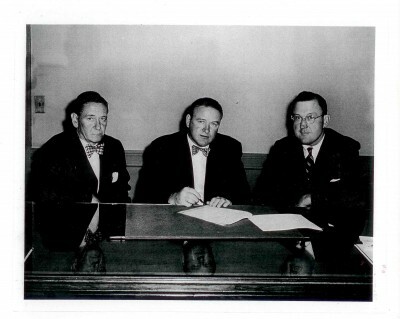 Joseph Cronin, General Manager of the Boston American League Club, and Carl W. Haffenreffer, Treasurer of Narragansett Brewery, Robert B. Choate, President of Station WHDH – key station of the Narragansett Baseball Network, completed the negotiations at the Fenway Park offices. John W. Haley, Advertising Manager of the brewery, present at the signing, stated that plans are already underway to provide complete coverage as possible with the present Narragansett Baseball Network of 41 AM and FM stations augmented to reach every corner of New England and adjoining sections of New York State and Canada. At this time Narragansett Brewery has reached no agreement with the Boston Braves for either radio or television sponsorship.